A month or so ago we were on our way back from Gran Canaria after a fantastic family holiday. I had run every day on untouched trails far away from the resort and its clichés. For me, the reason is simple. Two things. Autumn and winter, cold and darkness. Rain doesn’t bother me, I love to run in the rain, but motivation to run is always so hard when it’s cold and dark…and the duvet doesn’t want to release you at 5am. Last year, as I got more and more involved in trail running, I bought my first headlamp to avoid having to just pound the pavement during the working week, when the only time I can run is in darkness- before or after work. It was a Petzl Tikka 2 and was pretty cheap at around £25 and a good entry level lamp I was told. Indeed, it has been great but I didn’t use it as much as I thought I would. The light was good, but not amazing and it made running around tree roots and rocks a little more perilous and therefore slower and therefore colder than I would have liked. I couldn’t enjoy running with it and it seems most people use it as their back up torch- something to get you home or to the next aid station if your main light fails. As I sat in the airport at Gran Canaria I knew I had six months of pretty grim weather ahead. It’s not like the crisp white Alps or Boulder, Colorado or any of those places I see on Facebook all the time as I follow elite trail runners with bright skies and snowy trails. Its wet, damp, dark and muddy. All manageable, but not ideal conditions to motivate me at a time when I could really improve my form in the off season. So I made a decision to get a headlamp that would help my confidence with night running and get me away from the early morning city streets. I wanted to run where I ran in June, when it was light at 4am, the hills and valleys, footpaths and national trails around Bath. But which brand to choose? One thing I had to look forward to upon returning to the UK was volunteering towards the end of the Cotswold Way 100 mile race. I know this route well and it was exciting to see a 100 mile race having been created on it by Cotswold Running. After the day was done, I noticed that some of the prizes were from a company called LED Lenser, a German firm, and from the packaging alone looked like great head torches. I’ve got to be honest, I hadn’t heard of this company before so decided to look into what they provide. In short, they provide a world leading range of extremely high quality, precision lighting systems, from head torches to virtual floodlights. As we have come to expect from high quality German manufacturing, pride is taken in the finish and superiority of what they create. I had found what I was looking for. From a running perspective, the range to look at is the SEO series. These include SEO3 and SEO5 as well as SEO7R. Simply, the numbers relate to increased Lumens (brightness) in increasing order and the 7 version adds the ‘R’ for rechargeable. In ascending order, the SEO3 offers max output of 90 lumens for up to 20 hours or 60 hours at 15 lumens. The SEO5 offers max output of 180 lumens for up to 10 hours or 50 hours at 20 lumens. Finally, The SEO7R, which I have tested now, offers up to seven hours at 220 lumens or 40 hours at 20 lumens. There were two main reasons I chose the SEO7R to review and these were the fact it was rechargeable but also allowed three AAA batteries as replacement to the rechargeable unit and the fact it offered the brightest light of the three ranges (all of the lamps are fully rainproof and fitted with anti-allergy straps). Being rechargeable meant in a race, where I would likely need the headlamp for up to ten hours, I could use the rechargeable battery for five to seven hours before switching to standard batteries. The battery compartment is sat behind the bulb and is easy to access. The rechargeable unit is very light and does sit comfortably on the forehead without needing the strap to be super tight. However, with standard AAA batteries x 3, I did notice it felt heavier and the strap did have to be tightened in order to stop it slipping down my forehead every few minutes. The solution being you can order replacement rechargeable batteries and this is what I will do for next summer when I need the lamp for longer periods of time. I can leave the spare unit fully charged with crew or a drop bag and simply swap over without the need for standard batteries aside from emergency back up. Replacement straps can also be ordered. The fit of the lamp is very much the same as the Petzl Tikka 2 and weighs the same I would say. No noticeable difference at all. The difference comes once the torch is switched on. Initially there were a few confusing moments as I ran through the instructions and explored all of the lighting modes. One push of the on/off switch takes you to full bright beam, two pushes to 20 lumens reserved power, three pushes to reactive light- meaning it senses the brightness around you and adapts power accordingly- and four pushes to a flashing light. Aside from these, there is also a setting to hold down the power button for two seconds as soon as you switch on and this changes to a red light to protect night vision, with a second push for flashing red. Finally, if you hold down the power button for five seconds, this ‘locks’ the torch meaning it cannot be accidentally switched on in your backpack as you carry it during the day. To date I have mainly used setting three- reactive lighting. This means full beam on a moonless night on a footpath, reserved power when running with background light and anywhere inbetween depending on its assessment of natural light around. I haven’t tested this to the point of the battery fading yet, but have comfortably gone for over seven hours without needing to re-charge the unit. Furthermore, and key in a race, a sensor also tells you when battery life is low allowing you to change it before light dies, but I haven’t got to this stage yet. The main thing for me is quite simply how bright this light is. It honestly is like chasing a patch of daylight in a small circle ahead of you. One final setting is that the torch can be moved up and down on a swivel and the beam can also be refined to a wide floodlight through to a small spotlight, via turning the bulb casing. I have preferred the floodlight as it gives a greater perception of my surroundings but I can see why it would be useful to limit to a smaller area at times. Importantly, I haven’t felt myself have to slow down or pick my way over rocks or roots like I did with the Tikka 2. I have felt like I have been running as I do during the day. I’m not sure I would use the reduced setting or the red light settings unless running low and needing to desperately conserve battery, but would always opt for the bright light where possible. In conclusion, I am a summer runner. I am not a fan of winter and often joke about getting a special Seasonal Affective Disorder (SAD) Lamp to combat the dark winter period at home. 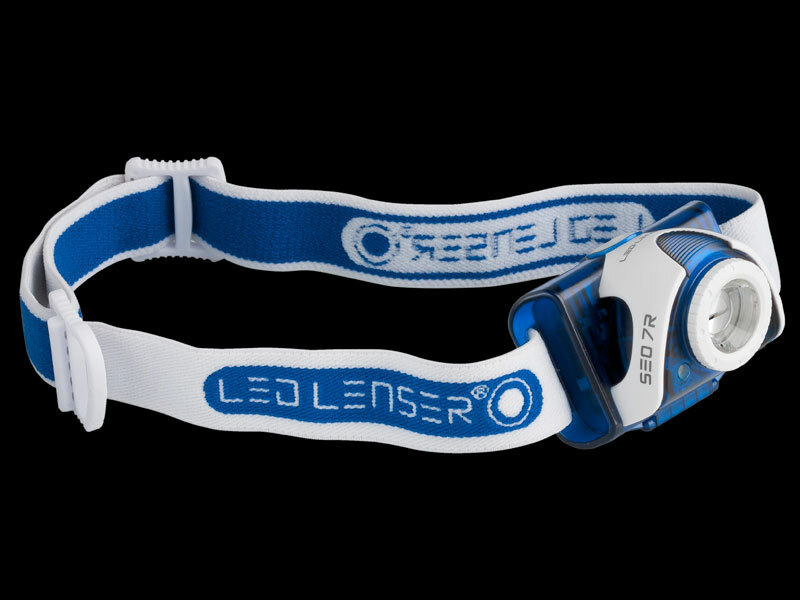 I’d say that this is a SAD headlamp for semi-depressed post summer runners like me. The only issue I have had with this lamp, I also found with the Tikka 2. Without something like a hat or Buff underneath, they can get painful on the forehead after sometime. Combined with sweat, this can lead to a graze and become annoying. I would like to see more padding around the front strap where the lamp meets the forehead and I believe this would be easy to incorporate, even as an extra. This would mean not needing to wear anything else on the head and help keep the user cooler on warmer evenings. The reason I referenced my holiday at the beginning of this piece? Running with this headlamp was like running towards a little circle of holiday light. It really is a cracking bit of kit and at RRP £75 is significantly better value than other rechargeable lamps within this power range. Thanks for this review. I’ve been considering a Lenser to replace / augment my Petzl Nao, which has fantastic output but poor run time.